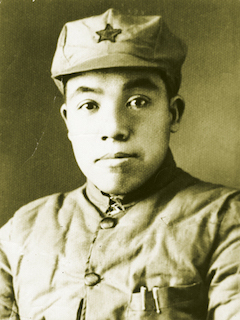 Mao Zemin, younger brother of Communist leader Mao Zedong, was executed on this date in 1943. A party cadre since 1921, the non-chairman Mao served a variety of economic leadership posts for the Red Army. As of early 1941, Mao (English Wikipedia entry | the far more voluminous Chinese was detailed to the western province of Xinjiang, where the warlord Sheng Shicai maintained friendly relations with the neighboring Soviet Union. To Mao’s grief, this “King of Xinjiang” saw in the unfolding global war an opportunity to realign. After the German invasion of the USSR in 1941, Sheng boldly flipped his affiliation from Moscow to the nationalist Kuomintang government with which he had theretofore maintained only the frostiest of relations. Crackdowns on Communists ensued too, and both Mao Zemin and Chen Tanqiu were both arrested, tortured, and executed as a result. Needless to say this KMT-Xinjiang axis did not hold the Celestial Empire’s destiny and the whole decision to fade Moscow looks pretty dumb in retrospect. Sheng, however, surely did not much regret the gambit since he was able to follow the nationalists to Taiwan and spend a comfortable retirement writing memoirs like Sinkiang: Pawn or Pivot? Mao’s son Mao Yuanxin, a still-living pensioner as of this writing, was a political figure in the 1970s who was jailed post-Gang of Four.